The smart people at eBay are sly trend-spotters, so they opened an official category for real estate transactions in the fall of 2000. You can access eBay’s Real Estate category through the category link (on the left side of the home page) or by going directly to realestate.shop.ebay.com. Since the founding of our country, land has been valued as a great commodity; passed from generation to generation. People buy land for investment, vacations, or retirement. It’s no longer common for a family to spend their entire life in one home. Real estate, although a major purchase, is becoming more and more an everyday transaction. Because substantial legal restrictions are involved in real estate transactions, sellers can choose to list their properties either as auctions or in the form of classified advertisements, depending on the laws in their areas. 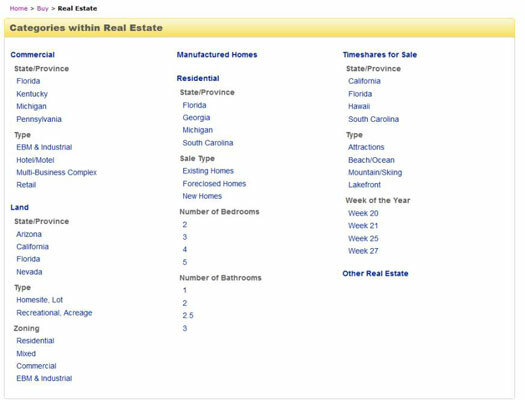 The categories in eBay Real Estate are varied. When you participate in a listing that is in an ad format, you do not place bids. At the bottom of the item’s description page is a form for you to fill out that’s sent to the seller. After the seller receives this information, he or she can contact you, and the two of you may negotiate privately. When you browse the Residential Homes category, such listings will have the words Classified Ad next to the title. Many residential home sales are handled in this manner. Land and timeshares are typically sold in the auction format. Because of a wide variety of laws governing the intricacies and legalities in real estate transactions, the auction format may be nonbinding. Before getting involved in any real estate transactions on eBay, read the official rules, so you know what you’re getting yourself into.